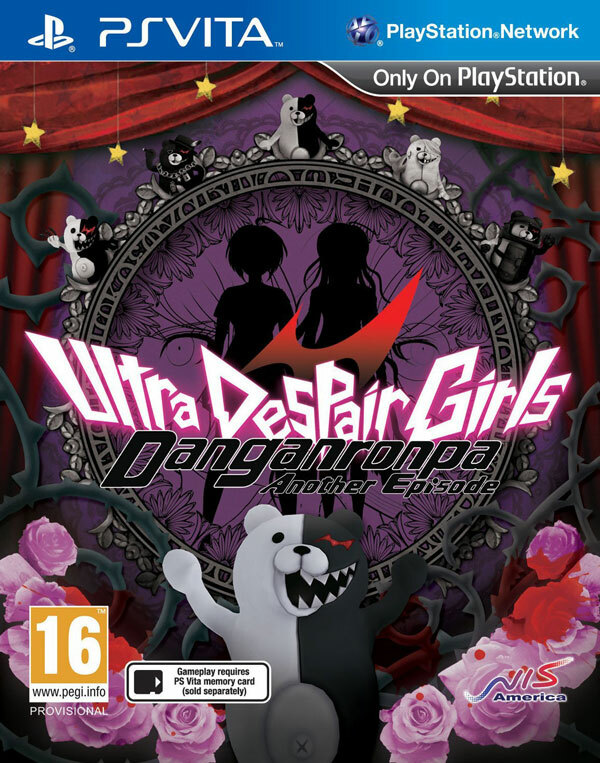 Danganronpa Another Episode: Ultra Despair Girls is the first Danganronpa game to be built for PlayStation Vita. 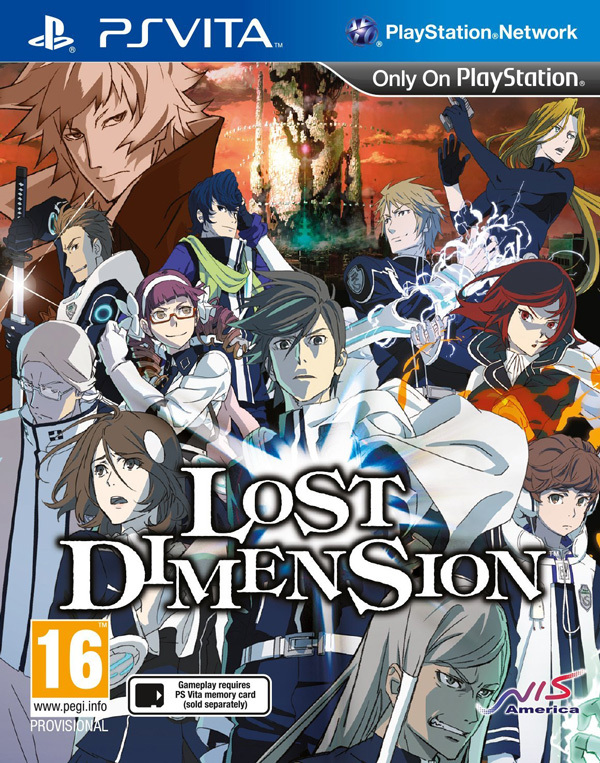 The first two games were originally on PSP in Japan, with the west only receiving the enhanced Vita versions. 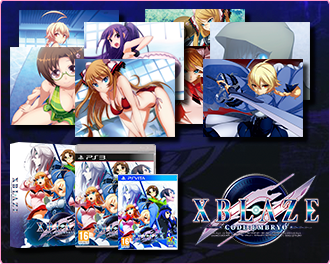 There are some immediate improvements – full anime cutscenes, fully 3D characters and environments, and highly stylised graphics that are some of the more impressive on the Vita. But the biggest addition to Danganronpa is almost certainly the actually gamey gameplay. As Visual Novels the first two Danganronpa games don’t feature a lot of it, mainly focusing around how you interact with the other characters during free time, investigation sequences, and courtroom sequences (all of which are fantastic, by the way). Ultra Despair Girls is quite different. It’s set between the events of the first and second Danganronpa games, and is more of a side-story spin-off (hence “Another Episode“) which is built around a core survival horror gameplay loop. Or at least, it seems that the survival horror is the core element of the game at first — but it’s hard to say it really follows through on that. 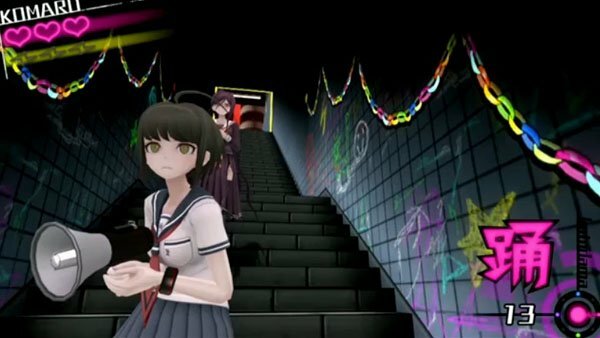 The audience identification character and primary protagonist of the story is Komaru Naegi, the little sister of Makoto, the main character from the main series, who’s been held prisoner during the events of the first game in an apartment in Towa City, a futuristic city ran by the Towa Corporation. and one that has managed to avoid the worst of the “Incident” alluded to in the first game. 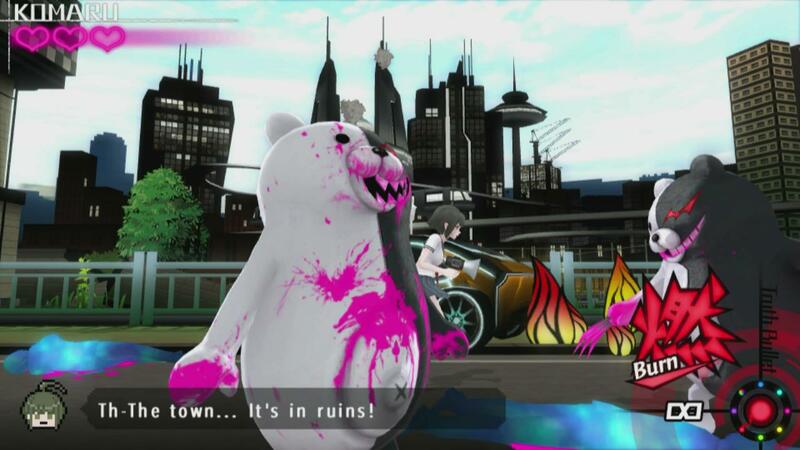 She is finally freed when Monokumas attack, devastating the entire city, and is given a hacking gun that can shoot “truth bullets” at Monokuma and other electronics with varying effects. At the start she has unlimited access to every bullet, but by the end of the Prologue this is taken away in a Castlevania: Symphony of the Night kind of way. Stripped back in this way might be where the gameplay works best, as is quite often the case with survival horror in general. 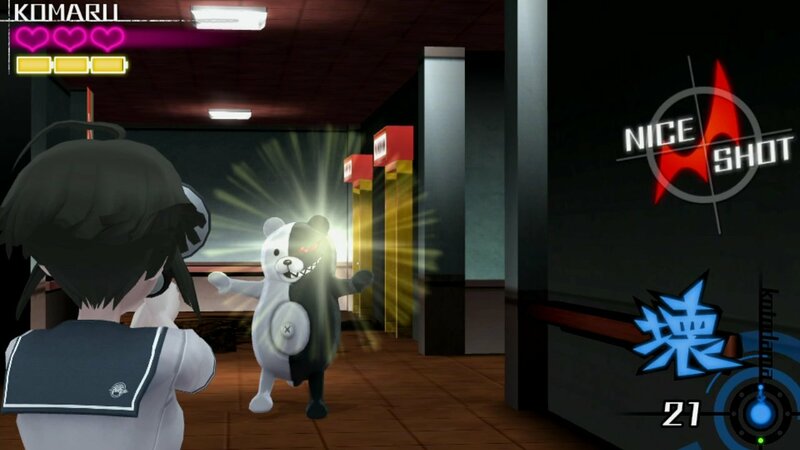 Wandering ruined streets and buildings with limited Break bullets, edging around corners and listening out for the tell-tale sounds of Monokuma, trying to hit them from a distance in their red eye, granting better rewards and a power increase to your next shot, is perhaps the highlight of the gameplay experience. As usual there is a creepy and morbid, yet colourful and vibrant, atmosphere to Danganronpa — even in a less enclosed setting — perfect for a survival horror setting. Komaru is also joined by Toko Fukawa from the first Danganronpa for the majority of the game. She’s the character with the somewhat problematic depiction of Dissociative Identity Disorder who is sometimes a somewhat abrasive and repressed writer with a bit of a wicked and mean streak, and also sometimes an (ex-)serial killer known to the public as Genocide Jack. Toko has learnt to control this side of her using some sort of shock therapy, and can now switch at will using a stun gun. Also, for some reason Genocide Jack has straight up superpowers now, such as being able to leap impossible distances. At one point she straight up jumps onto a speeding monorail train from the ground. Essentially this means you can hit Triangle to switch from controlling Komaru to controlling Genocide Jack, expending your battery gauge. She’s very powerful, and can dispatch even the stronger versions of Monokuma with relative ease, zipping between them, and even unleashing powerful special attacks, which you can choose to target specifically on one enemy or an are attack to hit several. Pretty simple hack and slash stuff. When not in battle as Genocide Jack Toko can also use the stun gun as a sort of “final save” to stun an enemy about to finish off Komaru, at the cost of one segment of battery. Though the harder modes limit the use of Genocide Jack, it still doesn’t stop the ability to change the game into a hack and slash at a moment’s notice from negating most of the survival horror elements. Overwhelmed by Monokuma? Just have Genocide Jack kill them all instantly. Shakily trying to aim at stronger Monokuma dashing at you in a dark corridor? Get Genocide Jack to dash right back at them. 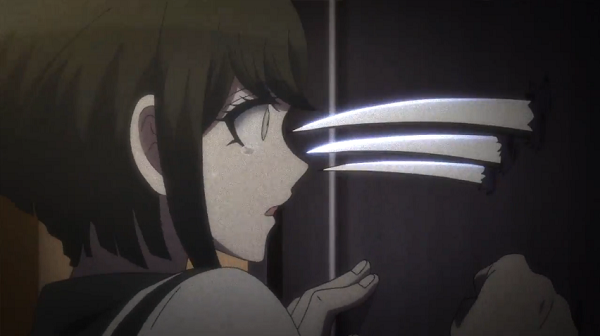 The traditional style survival horror of Komaru’s gameplay just does not mix well with Toko’s hack and slash gameplay. And the types of gameplay don’t stop there. There’s also “Monoku-man” rooms, where you can hack a Monoku-man arcade cabinet to get a view of the next room, filled with Monokuma, and assigned a challenge. For example, you might need to kill all Monokuma with an explosion. All of these rooms have pretty tight solutions, and finding the solution is never particularly challenging. The worst they get is through no fault of your own, when you use a hacking ability to attract a group of Monokuma to a particular area and one keeps getting stuck on a wall it shouldn’t every time you try it. At first, these rooms are fairly few and far between, but they become more and more frequent as you progress, basically turning the game into a mediocre puzzle game. Some of these are optional, but most aren’t. Finally there are also a few riddle challenges. There aren’t actually too many of these in the game, but they feel the most Danganronpa of all the gameplay types. None of them are too challenging, apart from one that sees you having to deduce a deceased person’s birthday using clues from about the room, which the only one that is pretty explicit about giving you hints. The riddles are challenging enough to force you to think about them, and make you feel accomplished for figuring it out. They’re good. If all of the Monoku-man rooms were replaced with riddles of the same quality as the ones on show, it’d be a much stronger game for it. There are some other bits and bobs thrown in there too. Navigating a dark room by following a trail of UV paint, protecting NPCs, boss battles, and (worst of all), having to face waves of Monokuma at a time, a playstyle this game just isn’t really built for. But, it never really gets time to settle into one type of gameplay for any length of time as the game is constantly “interrupted” by story. Though in reality, despite showing some promise with its game-story balance early on, it’s more of a case of gameplay interrupting the story. That’s what Danganronpa fans are really here for after all. The Danganronpa games were great at mixing the gameplay it did have with the story, each interaction pushing the whole thing on — whereas here it just kind of happens. Collectibles are strewn about the maps, mostly quite obviously in the dead end “ways you’re not meant to go”. Of these the books are the best kind of pick-up, each one leading to a conversation between Komaru and Toko. 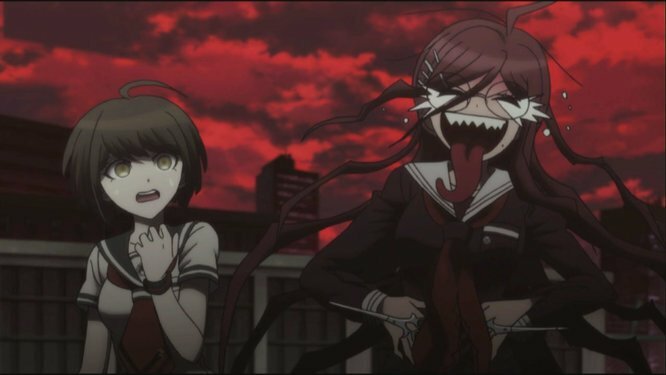 The two characters do have some genuine chemistry, with Toko having mellowed out a bit since the first game, and their interaction is often a joy to experience. The story itself is perhaps the darkest yet in a Danganronpa game. 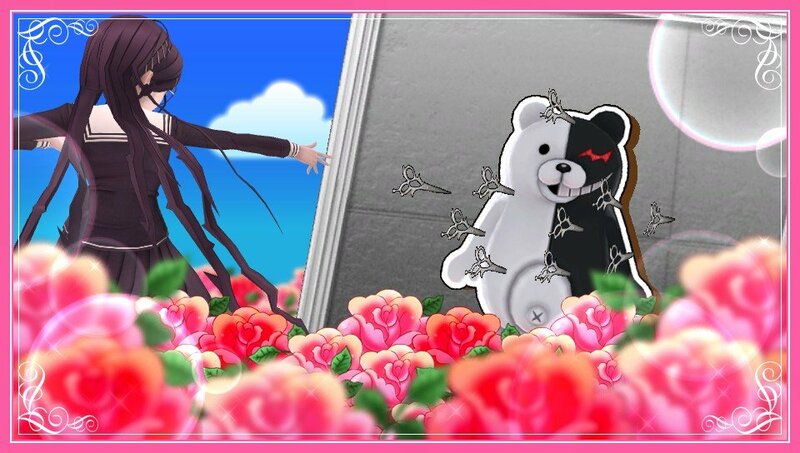 A group of children called the Warriors of Hope are using Monokuma robots to attack Towa City, brutally murdering any adults they can get their hands on in order to create a “Paradise” just for children. They are accompanied by a legion of creepy school children all wearing robotic Monokuma heads. They call adults “demons”, and there’s just enough of a believable edge to their cult-like fanaticism (mostly revolving around their manipulative leader, “Li’l Ultimate Homeroom” Monaca) to make it actually creepy and scary. The story is at times genuinely quite disturbing. Though it does lose its way in a couple of places it’s actually done very well more often than it’s not, and the same can probably be said for the other Danganronpa games too. While it’s certainly not necessary to play this to understand the Danganronpa story it’s definitely interesting to see what was happening out in the real world between the games. There are a lot of references to both games, and it does build on the world in its own way too. It’s especially nice to see Toko’s progression from where you first meet her in the first game to where she’s at now. Unfortunately the game is let down by its muddle and confused gameplay. 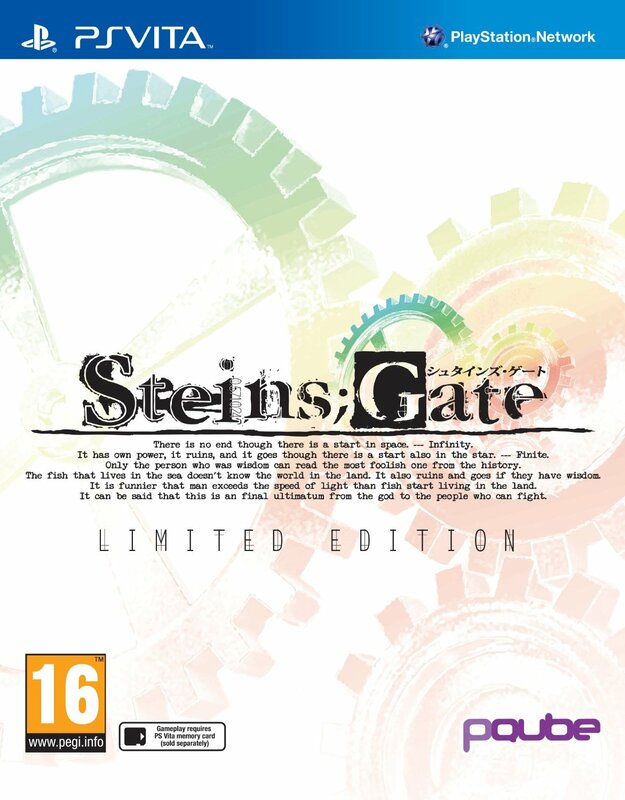 By not having all the same features as a mainline Danganronpa game the experience of the story is held back too. But, it’s a good story nevertheless, and Danganronpa fans will definitely enjoy it. This won’t be the game to get anybody into Danganronpa, but it’s a nice enough diversion for fans waiting for Danganronpa 3. And, with Danganronpa 3 just being officially announced at TGS, it could be a nice little refresher to the Danganronpa universe before it comes out.